If you have children who are brought to church by someone other than a parent, perhaps another relative or a neighbor; you may want to use this special type of Extra Value called PIN. This PIN # can then be used in place of a phone number when anyone in the family is checking in. The Extra Value is named PIN and the value is is a number (any number of digits) that would be easy for those bringing the child to remember. Go to the people record for anyone in the family and click Profile > Extra Values and then Show Adhoc Extra Values . Select Text (multi line) as the Type . 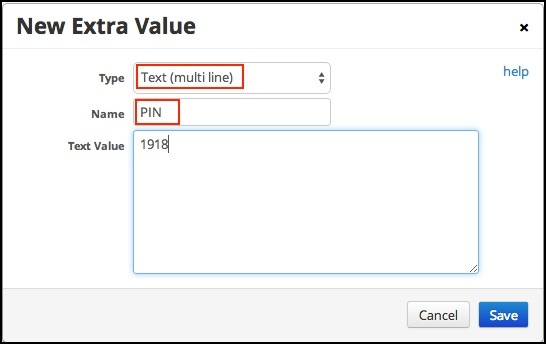 Enter PIN as the Name of the Extra Value. Enter the Text Value , which is whatever number the family chooses. Do not use anything other than numbers and do not use any spaces. Now, when someone wants to check-in any member of that family, they can enter the PIN# or the phone number. This is not a Family Extra Value. However, you only need to put the Extra Value on one family member’s record, and you can use it to check in anyone in the family. TouchPoint also has another Extra Value that relates to Check-In when it is used along with a special setting in the database. See the Extra Value - Parent article, the section regarding Check-In.